Turtles may not be cuddly, but they are awfully cute and generally easy to care for if you’re well researched and prepared. 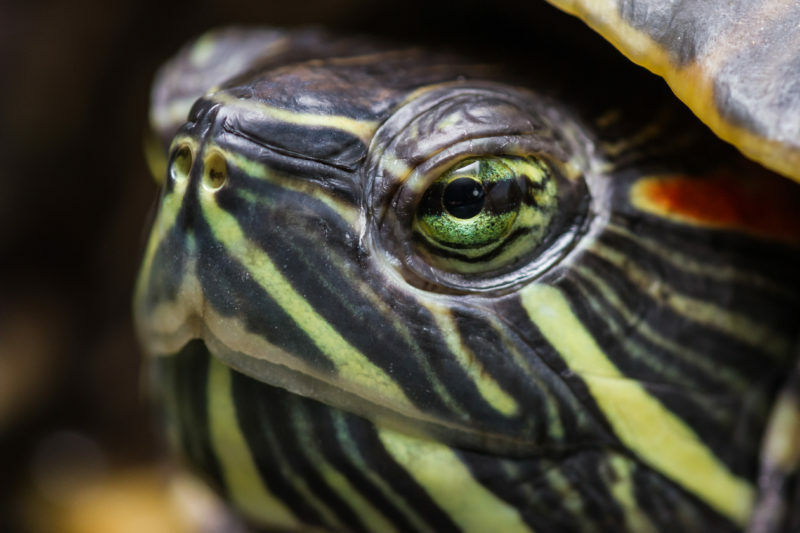 Although turtle-care isn’t too difficult, it’s essential that their environment be well maintained, said Dr. Stewart Colby, DVM and founder of Windward Animal Hospital in Johns Creek, Georgia. “In general, turtles spend most of their life in the water and thus need an environment that has water to swim in and a place to climb out if they so choose,” he said. If you’ve ever wondered how to take care of a pet turtle, or you already have one but want to brush up on your turtle parenting skills, consider this your turtle tutorial. Let’s start with a quick explanation on the difference between a turtle and a tortoise. 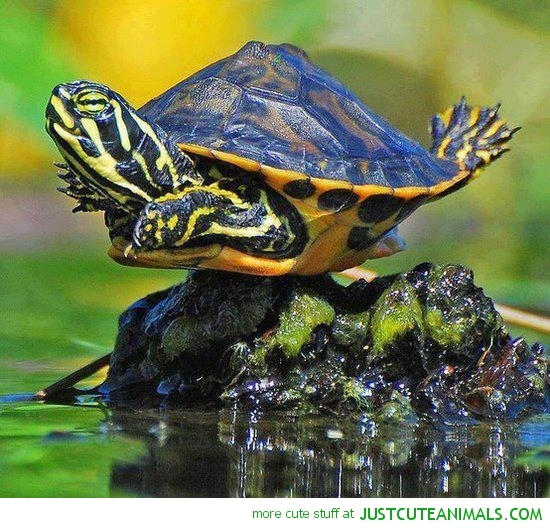 Turtles spend most of the time in the water, while tortoises live on the land. Terrapins are also turtles, but generally split their time evenly between land and fresh water. Red-eared sliders: a water turtle (though it does require land) that can grow to be as long as 11 inches, the red-eared slider is the most popular type of turtle to have as a pet throughout the world. Painted turtle:a colorful omnivore that can grow as long as seven inches. These are the most widespread native turtles throughout the United States. Central American wood turtle:also known as the ornate wood turtle. These turtles are mostly herbivore, but if you feel like offering the occasional insect or worm, they’ll gladly take it. They grow to be as long as nine inches. African aquatic sideneck:this omnivore has an unusual “folding neck” and can grow as long as eight inches. They’re mostly aquatic, but they need a spot where they can bask in the light. Caspian pond turtle:a semi-aquatic omnivore turtle that requires both land and water, it can grow up to be nine inches. Greek tortoise:a land-dwelling animal that will need a shallow water dish where it can soak and drink. They’re strictly herbivores and can grow up to 12 inches. Russian tortoise:another land-dweller with a need for a shallow water dish. They can grow up to eight inches. You’ll likely want a terrarium for your turtle, and it’s better not to skimp on size. “These animals require water and land with ample room to explore. The bigger the enclosure, the better,” said Brian Ogle, a science instructor who specializes in animal behavior and pet ownership at Beacon College in Leesburg, Florida. Maintaining your turtle’s environment is very important to stay on top of. If something is going to go wrong after you get a turtle or tortoise, it’ll be here. If you’re thinking you don’t have time to maintain a turtle’s environment, you may want to consider a primarily land-dwelling tortoise. You’ll still have to make sure the terrarium stays clean, of course, and change or refresh the water, but there’s less water to change. You’ll want thermometers for both the air and water in order to maintain an environment similar to whatever your turtle or tortoise would find in the wild. Do your research to determine exactly what temperature your type of turtle will need, as just guessing at what seems like a good temperature can create health problems. If your turtle is constantly in air that’s the wrong temperature, they may stop eating or get a respiratory infection. It’s also best if your turtle can get some sunlight, too, said Susan Tellem, of American Tortoise Rescue in Malibu, California. The sunlight, she says, helps their shells develop property; without it, they can get metabolic bone disease. It depends on the type of turtle you have, of course, but turtles will generally eat insects, fish (like comet goldfish, which are smaller than the common goldfish) and dark, leafy greens. You can also buy your pet canned or pelleted turtle food and freeze-dried mealworms. Tortoises, on the other hand, are herbivores and will require a mix of fresh vegetables (about 80 percent of the diet) and fruit (20 percent). Unlike other pets you might have, turtles don’t need to be fed every day. As a general rule of thumb, feeding your turtle four to five times a week will be fine, unless you have a young water turtle, in which case they should be fed every day. “In the wild food would be limited, so mimic nature when you care for your animal,” Tellem said. You’ll also want to add calcium to your turtle’s diet. You can get a calcium supplement and “dust” their food with it twice a year. 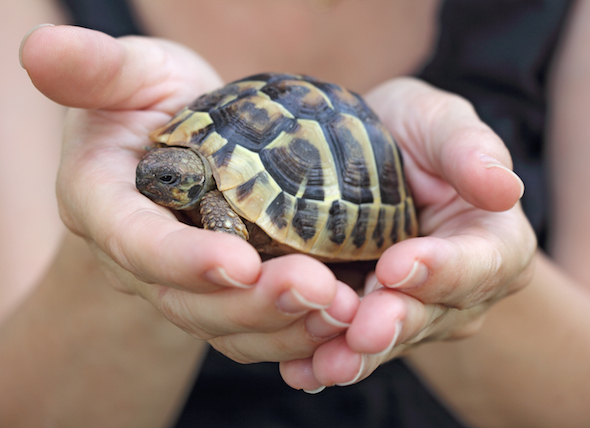 Providing good, consistent care for your turtle or tortoise will keep it healthy and happy. Generally, health problems in these animals arise when owners don’t feed them properly, or if they don’t clean the terrarium regularly or maintain clean water, or if they aren’t offering their pet the right temperature, Colby said. The most common disease turtles carry is salmonella, which is significant as it can be transmitted to humans and cause serious disease, especially in the immunocompromised. Keeping a clean terrarium, enforcing good hygiene with pet owners and buying an inexpensive conditioner to add to the water – Reptoguard makes some – helps keep organisms like salmonella at bay and hopefully prevent turtle diseases from ever happening. Make sure your terrarium’s water and air temperature is about 86 degrees Fahrenheit and that your baby turtle has access to both land and water. Make sure the water isn’t too deep. Your baby turtle is learning to swim, after all. A good rule of thumb is that the water should be about an inch deeper than the width of its shell. Even the smallest turtles should have a terrarium or aquarium no smaller than 29 gallons, no shorter than 4 feet long, 18 inches wide and 18 inches tall. If you don’t have a filter, change your baby turtle’s water daily. If you do, change it two to three days. 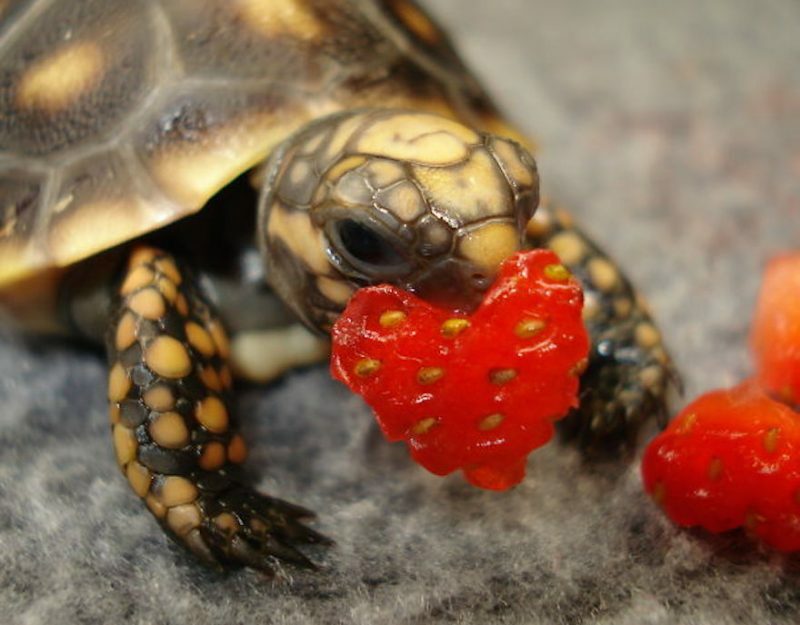 Feed your baby turtle every day up to two times per day. Finally, be sure to look for any physically signs of illness, including swollen eyes, discoloring on the shell and avoiding food. If you notice any of these, call your veterinarian specializing in reptile care. Many pet turtles can easily live about 20 years, which can be another reason not to rush into the buying process.